I'm a fortunate person. I live in a marriage where work, parenting and (often failed) domestic upkeep come at an attempted 50:50 ratio. This may not be 50:50 every day, but over the course of weeks, months, projects, seasons and the steady marathon we seem to be in, I feel like I have someone to evenly distribute the load with. One thing we can't take on as evenly are the well meaning questions on how we handle our balance of work and family life. Because the only person who is ever asked about it is me. "Where is your daughter right now?" is surprisingly common if I'm in a meeting and mention that I have a child. Sometimes there's "What does she do during the day?" And the stinger "Don't you miss her?" Yes, I miss my daughter. I miss her because time with my family is the most precious thing I have. It's why I cry every last day of vacation, knowing how lucky I am to have people in my life I will never find enough time to enjoy. I miss her in that I wake up every day still amazed by the miracle of her being my daughter, so I prefer to have her around. But no, I don't miss her right now. I am a woman working in a field that is a good fit for me, with compassionate employers and a stimulating work environment. I'm not leading a household on my own while working and still waking up living below the poverty level each day, when 53% of poor households in Dallas are female-headed and fighting that specific battle, likely amongst others. I'm not one of the two of every five Dallas families who would fall below the federal poverty level if they sustained a crisis and found themselves out of work and income even for only ninety days. It is a very fortunate thing to feel motivated by accomplishment and creativity in the morning, instead of feeling like I am going into battle against fear or instability. I try not to take this feeling for granted. Speaking of fear, I'm most fortunate to not miss my daughter because when we're apart during the day I do not fear for her safety and well being. 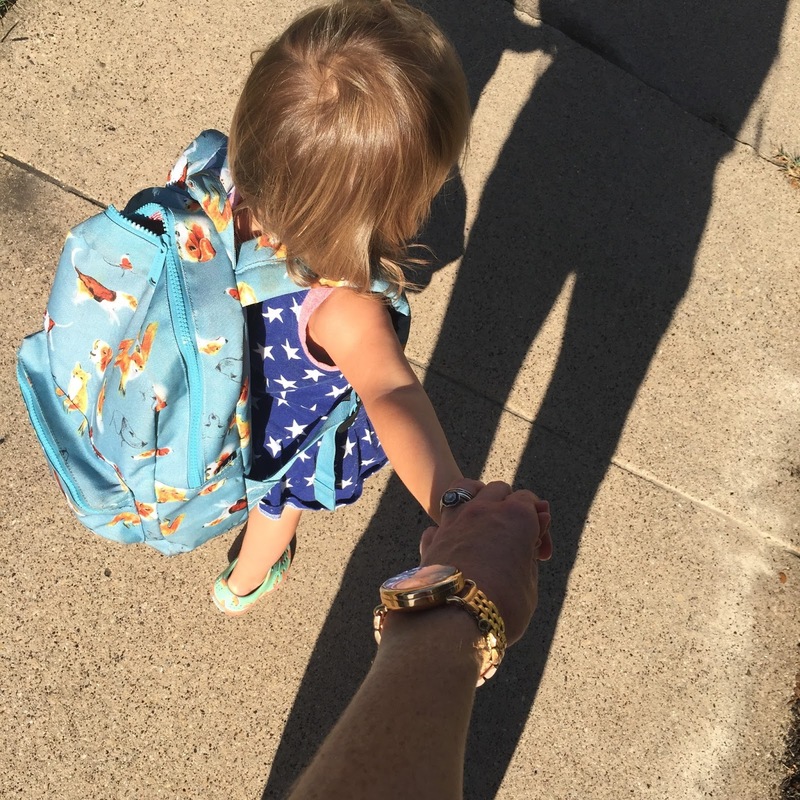 Adopting Heidi, I learned quickly that child care in Dallas is not a birth right. I feel fortunate for the partnership I've enjoyed with Heidi's development and childcare professionals, who helped her establish a healthy sleep schedule, encourage her to try new foods and enable her to learn through group play. I've never had to go to work concerned for my daughter's safety. It makes the whole process work. When you are concerned for your child, nothing is working. Picking up my daughter is the best part of my day! This topic is something I know so well in my personal life, but never stopped to think of much on the scale of all working women in Dallas until I was able to meet with the Dallas Women's Foundation and Dallas Afterschool. While it shouldn't surprise me to hear it, I am in a fortunate minority of women in Dallas who have had a relatively easy time with child care. And it's not a problem that becomes easier once kids start school, like I had hoped. As a mother to an 18 month old, I try not to get ahead of myself on my parental anxiety. There's plenty to expend on any of our current situations, anyways. But I often catch myself wondering about the hours of 3:00 - 6:00 p.m. Where will Heidi go once school is out? It's a lot for me to think about now, but it turns out it was on my mind for good reason. According to the partnered work of Dallas Women's Foundation and Dallas Afterschool, 59,000 children in Dallas are left alone to care for themselves between the hours of 3:00 - 6:00 p.m. This doesn't include those who are with an older sibling. It's crazy to me. It's hard on kids and it's hard on moms who have to make the choice to let their child be alone at home, which few would willingly make. I was once again reminded of the ripple effect these problems create. Learning about these issues, it surprises me very little that juvenile crime triples between these hours, when children are more likely to commit or become the victim of a crime. Wouldn't things be easier if we could enroll these children in after school care, where community fosters educational opportunities and social well-being? What I've learned about child care in Dallas is: it's out there but good luck finding it. We drove by Heidi's day school for years without knowing it had quality and affordable child care until I happened to broach the (often taboo) subject with a neighbor who tipped me off. Dallas Afterschool and The Dallas Women's Foundation are addressing the problem of sourcing after school programs first, and using this work to assess and build more resources for after school care in Dallas. 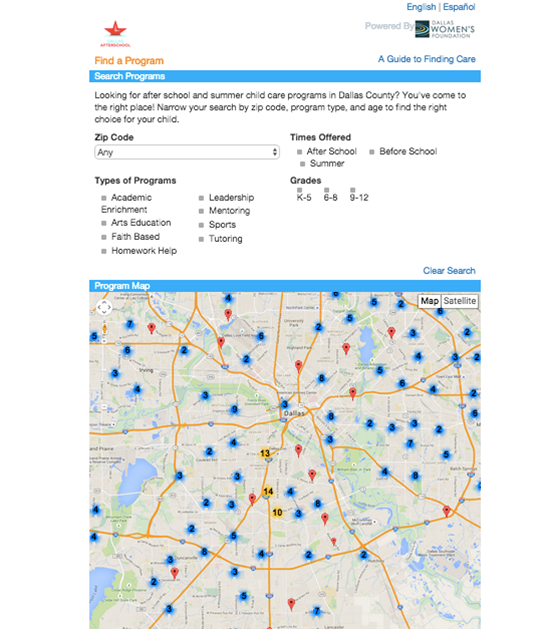 Findafterschooldallas.com is a new and free asset map built from hours of work from both organizations to make it easier for parents to find quality programming for children after school in Dallas. For the first time in Dallas, parents have one asset map to help them find licensed and exempt after school care for children along with valuable information on the program and contact information for registration. It's a better environment for children, better peace of mind for parents and a better community for us all to live in, all from organizing assets that were already in place. Dallas Afterschool is also using the map to find spots in Dallas in need of better after school resources which are, without coincidence, some of our lowest income neighborhoods. The goal of the non-profit is to make after school time better for kids with improved program quality, increased community support and access for all children. It was an honor to get to know their team and see how this is truly coming together. What a reminder of the privilege it is to have peace of mind about my daughter. I'm not sure how to most tactfully answer some of the personal questions that come with being a female working parent, but mom to mom I would advise to miss them all you want, as it makes together time very special, and feel happy to know that when you don't it's likely because of the loving and resourced community you're a part of. Thank you to Dallas Women's Foundation and Dallas Afterschool for hosting me for a demo of Findafterschooldallas.org. I am looking forward to seeing a brighter future for children who are able to access our after school programs more easily from your hard work! To learn more and support these noble causes in our community, please visit the Dallas Women's Foundation and Dallas Afterschool websites. This article should read more people.